Ali Bagautinov is a very good challenge, he’s well-rounded, has good boxing and heavy hands, but I don’t see where he beats the champ tonight. 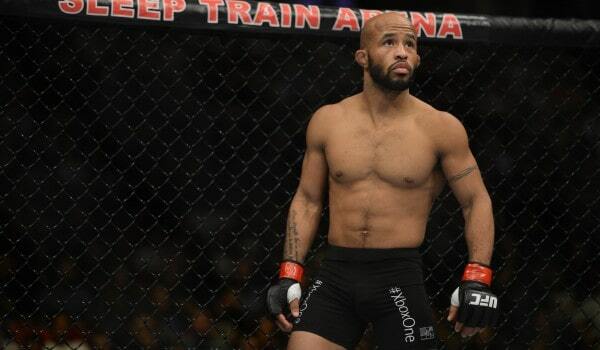 Honestly, Demetrious Johnson just needs to do more of the same to win in this one. Johnson has been proclaimed as the fastest man in MMA, which comes not only from his ability to give a shot without taking one back, but also from being able to change levels and shoot for takedowns at a ridiculous speed. While Johnson doesn’t want to get into a boxing match with Bagautinov, he should look to set up those takedowns with a few punches from the inside as he tends to shoot from distance at times; which could cause him to eat unnecessary shots. As for Bagautinov, I don’t see many paths to victory, but if he is somehow able to force Johnson to stand with him on the inside he could always land a big shot. Bagautinov could find early success on the feet, but Johnson’s constant adjustments and gas tank will be too much. This one is really tough to call. I’ve been back and forth multiple times on who I’m going with here. Woodley obviously has an advantage in round one, he is able to land the big shots standing and should be able to find the takedown early. But after round one Woodley becomes more one-dimensional, reverting to his wrestling which could cause him big problems if MacDonald can stuff his shots. The biggest problems I see Woodley facing are MacDonald’s size advantage and his ability to nullify his opponent’s attack. MacDonald needs to use his size by keeping at range using his jab to set up combos, especially in the early going. Doing this, as he has done in the past, will force Woodley to shoot takedowns from the outside which wear him down. All in all, MacDonald’s jab could be one of the biggest benefactors in winning him this fight, preventing Woodley from closing distance and landing big punches will be key. In my opinion, this fight comes down to the takedown, if Woodley can find it he will likely come away with the win, if not MacDonald should have it. But in the end I see the hometown boy using his size advantage and coming away with the decision. Ryan Bader would be smart to turn this into a wrestling match; although he also has power, it’s obvious that “Feijao” is the more dangerous striker here. If both guys were to come out swinging for the fences, I wouldn’t be surprised to see a knockout on either end. Again, this will likely come down to Bader’s wrestling. If Cavalcante is able to stuff Bader’s takedowns early it could frustrate Bader and cause him to get sloppy, a la Lyoto Machida. Another factor that we are all aware of is that Cavalcante is at his most dangerous when he has his opponent against the cage. Although I don’t see him controlling Bader against the cage, Cavalcante can use his striking to keep Bader on his heels and unleash from there. If Cavalcante is able to defend the takedown he needs to keep it technical and not go punch-for-punch with Bader. Although this fight may not stand out to a lot of people, I’m actually relatively excited for it. Brendan Schaub is the younger, more athletic guy, who’s looked very solid on the ground in his past two fights. I believe the key for Schaub here is going to be his athleticism. Schaub needs to be quicker to the punch and look to take this fight to the mat and work his top game. Although Arlovski has never been submitted in his 15 year career, I could see Schaub being the first to do it. For Arlovski, he simply needs to keep this fight standing and keep Schaub guessing by mixing up techniques. Throwing unorthodox combinations and even switching stances could cause Schaub to be hesitant to shoot that takedown and stay on the feet. Schaub isn’t known for having the best chin, a clean shot from Arlovski could put him away. In retrospect, we are dealing with Heavyweights who have been knocked out before, so don’t be surprised if you see a knockout for either man. Unbeknownst to the casual MMA, OSP has been insanely impressive, winning 12 of his last 13, with the only loss coming to Gegard Mousasi in 2011. And unless OSP comes in looking off his game, or gets caught with something big early, I see him getting past Jimmo tonight. Saint Preux should be able to overpower Jimmo in the clinch and get the takedown from there. This one will either end very quickly in the first round, or be a three round grappling affair that drags on and nearly puts us to sleep. Either way, I don’t think we’ll be seeing Ryan Jimmo doing the robot, sorry folks.